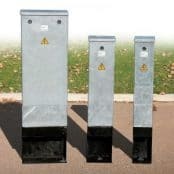 Lucy Zodion Mini feeder pillars are manufactured from galvanised steel (with optional painted versions) for LV power distribution and control – the top mounted tri-head lock secures the door in place for electrical safety and a vandalism deterrent. With the lock opened, the door lifts away from its slot location at the bottom of the cabinet to provide unrestricted access to the internal electrical components housed internal to the pillar. Mini Pillars are available in 7 sizes from the Fortress range: 113mm – 503mm widths with a 3mm feeder pillar shell thickness, single door and bitumen painted root section for improved service life. Small mini feeder pillars have a removable door, not hinged, to provide unrestricted access to the electrical equipment located on the pillar backboard. The feeder pillars are specified by most UK housebuilders and developers to provide low voltage electricity supply to new housing and residential development projects – the pillars can be custom engineered and pre-wired to suit the power supply requirements of the housing scheme. 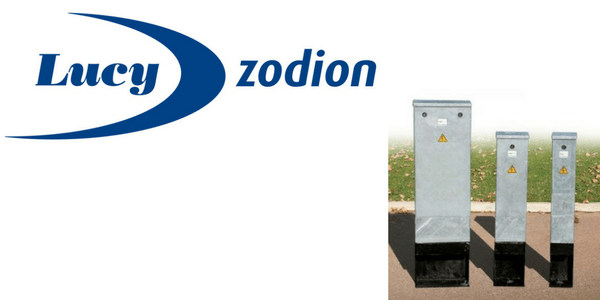 The ordering code for Lucy Zodion Mini feeder pillars from the Fortress range is comprised of 4 sections. Complete range of Feeder Pillar Accessories available.